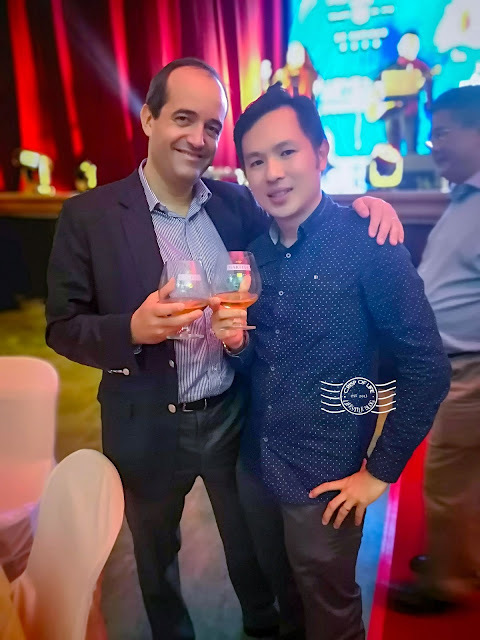 The usually quiet agricultural Valdor town in Seberang Perai Selatan of Penang gets unusually happening on 9th January 2019 when The House of Martell and Chivas Regal by Pernod Ricard organised the dinner series "Be Curious" with the theme Winter in Beijing. Ninety (90) tables were setup in the hall of SRJK Valdor as a homage to local population over their support to The House of Martell throughout the year. Thanks to Pernod Ricard Malaysia and Commas PR for extending the invitation. I was there to join the group of guests from Pernod Ricard Malaysia to celebrate this event. Guests started to flocking the hall at 7:30pm despite drizzle, and all were thrilled to discover that they will be treated with Martell VSOP Aged in Red Barrel, which was released to the market in the mid 2018. Martell VSOP Aged in Red Barrel is replacing the Martell VSOP Medallion which has been in the market for more than half a century. Matured in select barrels made of French Troncais oak, the new Martell VSOP Aged in Red Barrel gives a delicate fruit aromas with subtle wood notes and a light tender spice from red fine-grained oak barrels. It is less astringent from the Medallion, therefore more in line with the fruity Martell style. The new cognac also specifically crafted for food pairing. Diners of the night get to enjoy the cognac with some local favourites, such as "Wanton Noodles with Pork Trotters", Sea Cucumber, Pork Tendons and Scallops in Claypot" and etc. Then there were dancing, singing and games planned to excite the guests throughout the night. Some lucky guests even walked away with lucky draw prizes. Conviviality of the evening gets further immense when the guests of honour - Sébastien Mouquet, Pernod Ricard Malaysia managing director, Emmanuel Dokhelar, Pernod Ricard Malaysia Marketing Director, Martell Cellar Masters from French and the sales team from Northern Malaysia went from table to table to cheer with the diners. To up the ante on the dinner series, a seasonal reward contest is designed where one of the season's top spender and one lucky draw winners will receive all-expense paid trips for two to city destination featured at the dinner's themes - Beijing. On top of that, the year's top spender will also be invited to a Grand Finale, where the Grand Prize - a brand new Mercedex Benz E class, and the First Prize - two all expense paid trip to Chateau de Chanteloup in France, once the residence of the House of Martell's Jean Martell and two all expense paid trip to Strathisla Distillery, the Home of Chivas Regal in Scotland, plus other attractive prizes. Check out more information of the dinner series and seasonal reward contest at Martell Facebook, Martell websites, Chivas Facebook and Chivas website.